PRS – Whom do we represent? Tuesday evening I attended the FAC’s (Featured Artists Coalition) event on digital music. The FAC is a free membership organisation for featured artists whose goal it is to educate and empower independent featured artists. There were three speakers: a representative of PPL, PRS and a digital distribution company called Zimbalam, each covering the basics of how they work and what the benefits are. It was great to see a room full of artists willing to learn to help themselves and even better to know that there are organisations such as the FAC who are catering to these needs. I also want to commend PRS for sending a representative to such an event (everyone knows that the GEMA, Germany’s equivalent, would not have shown up). Ok, so why am I compelled to write this blog post? During the networking portion of the event I had a chat with the PRS representative that left me rather annoyed. For those of you who are not familiar with the organisation, PRS is a royalty collection agency. If songs I have composed gets aired on radio, TV or when I perform them live, the collection agency ensures that I receive my royalty payment for that. As an independent singer / songwriter, royalty payments are a substantial portion of my humble income. PRS market themselves as being run by its members for its members. They claim to represent all musicians from lady gaga to, well, me. However, this really isn’t the case. 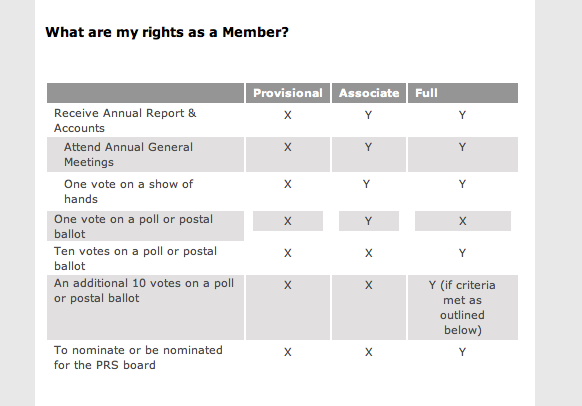 PRS have a three level membership service, in which only the top earners get to vote on matters and put themselves forward for board membership. This means that the agency is in fact an oligarchy, an organisation run by the top earners, looking after the interest of the top earners only… with a big marketing budget. “You wouldn’t want all those thousands of members who aren’t making a penny get a say. I mean, they might just act in their interest”. Well, finally someone’s being honest about it! Though unintentional, he put his thumb on the truth. Although it is in their interest to appear to represent all musicians, the objective of the PRS is to service top earners and top earners only, namely those writers who make a minimum of £20,000 a year on royalties and those publishers who make a minimum of £103,750 a year. For those of you who are interested, here’s a little screenshot showing you the numbers behind the levels of membership. You’ll see that the second level of members receive one vote each, whereas top earners receive 10 votes per individual. That’s right: 10. Also, it’s important to point out that being a so called “provisional” member does not mean your earnings are insubstantial, nor does it mean that we of the lowest income bracket are some sort of lazy benefit-fraudsters out to rob the rich of their golden trinkets. Every musician making below £2960 a year on royalties alone and all publishers making less than £14820 classify as “provisional”. I’m well aware that PRS have just launched more funding for upcoming artists, and I myself am applying (have I just blown my chances with this post do you think?). However, I can’t help but feel that these funding schemes are little more than lip service in the greater scheme of things. This is not about bashing an organisation. I have been a member of PRS for years now and believe it to be a necessary institution. This is about getting involved in a good thing and trying to make it better. I’d love to hear your thoughts, especially if you’re working at PRS! Thanks for sharing this Roxanne. I think it’s very easy to give up on revenue from collection societies like this when this is the attitude you come up against. One thing I have been wondering about and tentatively asking around about is whether it’s possible to register with a different collection society if you discover the first one you tried isn’t up to much. In a global market, surely this is where we could have more influence? If all the ‘smaller’ artists could find ONE good, reliable collection society for us songwriters and leave the other ones and register there, wouldn’t that have some kind of impact? Sadly, I suspect that a) you have to register in the collection society of your country of residence and b) there is no collection society that deals more fairly with the ‘smaller’ income band songwriters/publishers. Does anyone have any answers on this? What’s the deal in the US for e.g.? Aren’t there two options there, one for the bigger-income generating artists and one for the less so..? Hi Rowen, thanks very much for your comment. You bring up a really important point – that of healthy competition, which does not exist for PRS. There actually is an alternative within the UK, Sentric music http://www.sentricmusic.com/, but PRS have the clear monopoly at the moment and I’m not exactly sure how easy it would be to un-register… something to look into! Writers and publishers *can* sign up to a society anywhere in the EU, but UK performance income will always be dealt with by PRS. Therefore nothing to be gained from doing so. Roxanne, this made for very insightful reading and I was just wondering where you have been able to discover these gems? It’s certainly something i’d like to look into further, can you help me out? Do you mean the PRS tables? They’re taken from the members area of the PRS website. Hope that helps!